When planted in the ground with good drainage, water every 2 weeks April-October for 1st year only. No extra watering once the rains start. Xeriscape: in the San Francisco Bay Area with our winter rains, no watering should be needed after the first year, when roots are established. Micro-climates throughout SF vary, so your local watering needs may vary. Indoor in pots: A rough estimate is to water every 2 weeks for succulents and every 3 weeks for cactus. A little less in winter, a little more when hot. More for small pots. More in full sun, less in shade. 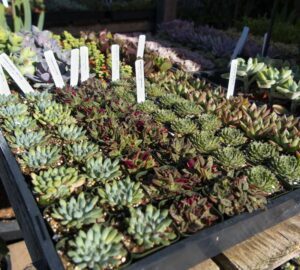 Succulents will often let you know when they need water: leaves wrinkle or wilt, bottom leaves drop off. Never let cactus or succulents sit in water – if the pot is in a dish, water at sink or add pot feet or pebbles. We recommend you water your new plant when you get it home to get it started on your watering schedule. Note: These are general rules. Plants are living organisms – local conditions will vary and plants are individuals. Some types of plants are more particular, like Lithops and Jatrophas; others are more flexible, like many Echeverias and some high desert Opuntias. “Tons of options, and the help has great information for you and are very friendly. I would highly recommend this place.” Shannon S.